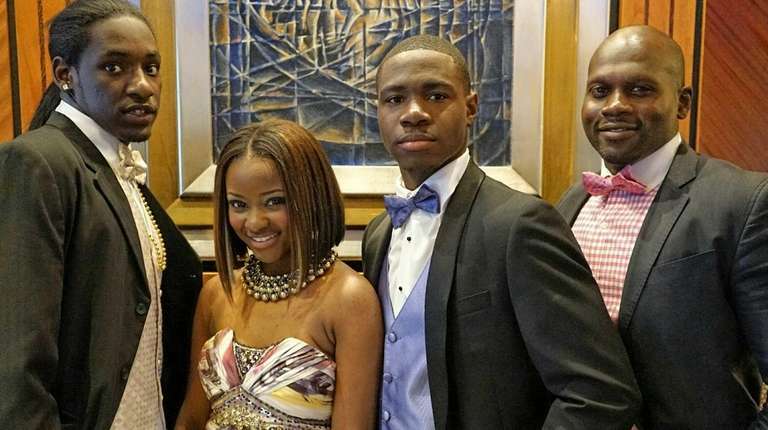 Makala Gordon had no plans of attending the Hempstead High School prom. The expenses associated with the event would pose a financial hardship, but she knew she'd regret missing the experience. "It's every high school student's dream to go to prom," the 18-year-old senior said. When asked by her cheerleading coach, Elise Nicholson-Dukes, if she planned to attend, Gordon explained her reasons for missing the big event. With just three weeks away from prom night, hopes were dwindling. "Suppose someone came along and would help you?" Gordon recalled of her conversation with Nicholson-Dukes. Gordon was in disbelief. "I just laughed," Gordon said. Nicholson-Dukes, who also works as the school's attendance aide, received a call from 1995 alum Dickey Antoine, who was interested in sponsoring two students to attend their prom. Immediately, two students -- Gordon and Donnell McCullough -- came to mind. Throughout the years, Antoine, 38, a Wheatley Heights resident, had become a fixture in the Hempstead community. For 23 years a since the age of 13 a he worked on a Mr. Softee ice cream truck route in Hempstead, and quickly built relationships. (He now drives a fuel oil truck and works as personal trainer, fashion consultant and designer.) Giving back was nothing new to Antoine, as he donated to local Little League teams. But with the prom sponsorship, he wanted to do something big. And with this year marking 20 years since he last walked the halls of Hempstead High School, the tribute seemed fitting. "I don't like the term paying back," Antoine said. "It's not paying back. It's paying forward." Antoine made sure no detail was left undone. He provided Gordon and McCullough, 18, with outfits, prom tickets and transportation. But for Gordon, the experience was even more glamorous. With a team of stylists, she had a complete makeover, complete with hair, makeup, nails, a fitted dress and jewelry. Antoine enlisted the help of family and friends. His wife Peta-Gaye, who works at China Doll in Baldwin, styled her hair, and friend Alexander Jay from Rashadema Boutique in Baldwin provided the clothing. While driving Makala to the boutique for the fitting, he asked her what color she and her date were wearing. Antoine quickly learned that Gordon had no date. "No one asked me," he said, remembering her conversation. Immediately Antoine had a solution. "I think I've got somebody for you," he said. He then called his nephew, Rashawn Powell, a senior at Sewanhaka High School. Throughout the past few weeks, Powell and Gordon have been getting to know each other. "She's a really nice girl," Powell, 17, said, suggesting that they would remain in contact after the prom. "I'd like to get to know her better. She's a really fun person and a blast to be around." With Gordon set, Antoine focused on ensuring that McCullough had what he needed for the special night. Antoine accompanied him to Men's Warehouse at Roosevelt Field where he was fitted for a tuxedo and shoes. At first, McCullough was unsure about attending the prom, but that changed once they arrived. "I'm having fun, everyone is having fun. Great way to end the year," he said. But more importantly, McCullough is appreciative of the opportunity. "I'm hoping that I can help somebody out in the future at Hempstead High School, something they need, something they want to do," he said, expressing his gratitude to Antoine. "Now I have memory pictures, to remember this night, this day," he added. "And remember everything he did for me."